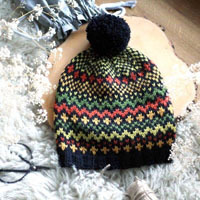 Go to original pattern for design DROPS 68-20. 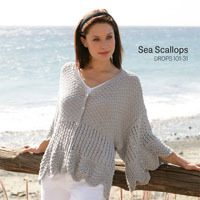 DROPS Pullover in Muskat, Cotton Frisé and Cotton Viscose. 250-300-300-350 g. col. no. 41, burgundy. 200-200-250-250 g. col. no. 05, rust red. 200-250-250-300 g. col. no. 08, cerise. DROPS 5 mm [US G] crochet hook, or size needed to obtain correct gauge. 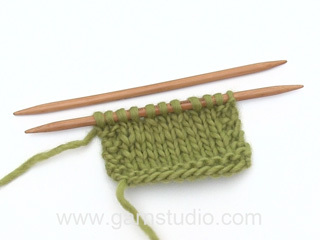 Gauge: 8.5 sts x 18 rows with 1 strand of each yarn (3 strands) in garter st = 10 x 10 cm [4" x 4"]. Front: Cast on 37-40-44-47 sts with 3 strands: 1 strand Cotton Frisé, 1 strand Muskat and 1 strand Cotton Viscose. Knit garter st over all sts. When the piece measures 7 cm [2.75"] inc 1 st at each side, repeat inc when the piece measures 16-17-17-18 cm [6.25" - 6.75" - 6.75" - 7"] = 41-44-48-51 sts. 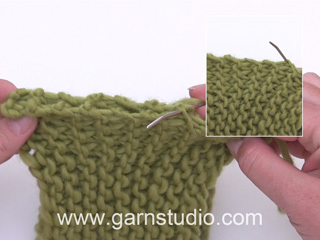 When the piece measures 35-36-37-38 cm [13.75" - 14 1/8" - 14.5" - 14 7/8"] bind off for armhole at each side every other row: 2 sts 1-2-3-3 times and 1 st 3-2-2-3 times = 31-32-32-33 sts. When the piece measures 48-50-52-54 cm [18 7/8" - 19.75" - 20.5" - 21.25"] bind off the center 11-12-12-13 sts for the neck. Dec 1 st at each neck edge every other row 3 times = 7 sts remain on each shoulder. 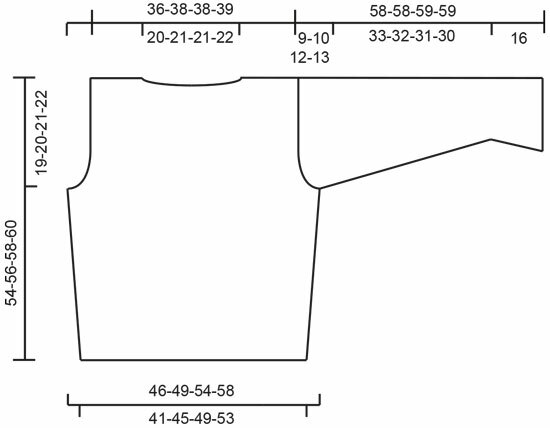 Bind off when the piece measures 54-56-58-60 cm [21.25" - 22" - 22 7/8" - 23 5/8"]. Back: Cast on and knit the same as the front. 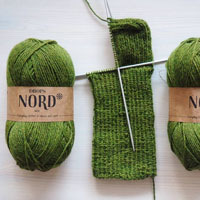 Bind off for armhole as on front and when the piece measures 52-54-56-58 cm [20.5" - 21.25" - 22" - 22 7/8"] bind off the center 15-16-16-17 sts for the neck. On the next row dec 1 st at each neck edge = 7 sts remain on each shoulder. Bind off when the piece measures 54-56-58-60 cm [21.25" - 22" - 22 7/8" - 23 5/8"]. 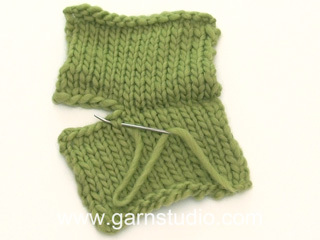 Sleeve: Cast on 30-31-31-32 sts with 3 strands: 1 strand Cotton Frisé, 1 strand Muskat and 1 strand Cotton Viscose. Knit garter st over all sts. When the piece measures 4, 8, 12 and 16 cm [1.5", 3 1/8", 4.75" and 6.25"] dec 2 sts evenly distributed on the row = 22-23-23-24 sts. When the piece measures 20 cm [7 7/8"] inc 1 st at each side 5-5-6-6 times every 6.5-6-4.5-4 cm [2.5" - 2 3/8" - 1.75" - 1.5"] = 32-33-35-36 sts. When sleeves measures 49-48-47-46 cm [19.25" - 18 7/8" - 18.5" - 18 1/8"] bind off for sleeve cap at each side every other row: 2 sts 1 time, then 1 st at each side until the piece measures 57-57-58-58 cm [22.5" - 22.5" - 22 7/8" - 22 7/8"] and then 2 sts each side 1 time. 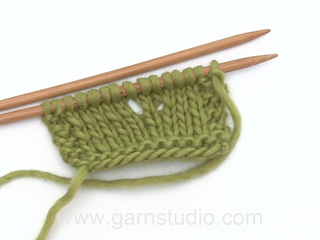 Bind off, the piece measures approx. 58-58-59-59 cm [22 7/8" - 22 7/8" - 23.25" - 23.25"]. Assembly: Sew shoulder seams. Crochet 1 row sc around the neck with double strands of Muskat. Sew in sleeves. Sew sleeve and side seams using edge sts as a seam allowance. Witaj Ireno! Nie jest podane ile oczek powinno być przy kończeniu rękawa. Ostatnia kalkulacja w rozmiarze M to 33 o. Na wys. 48 cm od dołu robótki zamykać z każdej strony co 2 rzędy: 1 raz 2 o., dalej zamykać 1 o. co 2 rzędy (nie jest napisane ile razy), aż dł. rękawa wynosi 57-57-58-58 cm. POWODZENIA!